Research has shown that employee engagement is the number one priority for CEOs. 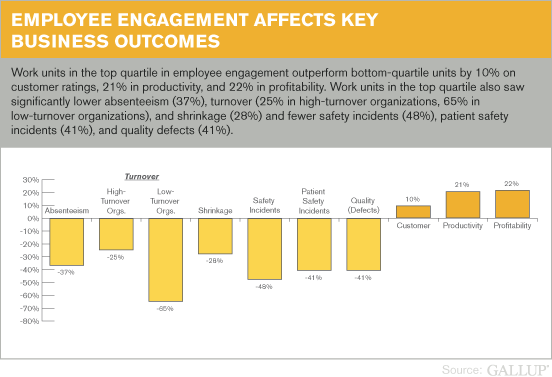 This is probably not surprising given the impact that engaged employees can have on an organization’s bottom line. A Gallup study done in 2012 concluded that in the US alone, only about 13% of the employees were actively engaged. The study also found that yearly productivity losses in the US arising from employee disengagement were a whopping $500 billion dollars with worldwide estimates of productivity losses touching one trillion dollars. No wonder CEOs are pushing employee engagement up their priority lists. However, there seems to be a serious disconnect betweeen CEO priorities and the way they are being tackled in the real world. Most organizations carry out a year-end survey if their employees are lucky or perhaps one in two years. The surveys tend to be fairly long and tedious with the result that the urge to finish does, more often than not, triumph over the need to give accurate feedback. In addition, the availability heuristic is in operation with the result that more recent events tends to dominate the feedback leading to a significant skew in the results obtained. Moreover, the time taken from conducting the survey to data analysis, report generation, trend identification and devising of action plans takes a good 3-4 months with the result that actions are taken a good 6-8 months after the issue had initially arisen. Managers are thus unable to be proactive in identifying issues and nipping them in the bud before they turn into crisis. Let’s pause for a moment to consider an analogous situation in sales. Can you imagine Sales leads only looking at their sales data at the end of every year and basing their actions for the next year on that? As incredible as that sounds, that is precisely what organizations are asking HR Leaders to do instead of obtaining feedback from employees on a more consistent basis. Josh Bersin from Deloitte has identified real-time employee engagement as one of the key disruptive HR technology trends in 2016. Given the rapid digitization of the world, a whole new breed of applications are coming up that use the digital technology to enable organizations to reach out to employees more often. These include but are not just limited to pulse surveys, textual feedback mechansims, peer to peer appreciation and anonymous manager feedback. The surge in such applications is also driven by the millenial workforce that simply doesn’t believe in waiting for a year to make their views known. Organizations are thus being forced to respond to their needs by providing them with avenues to express their opinions. While initial attempts utilized internal blogs and discussion boards, there is a growing realization that a more structured approach can reap greater benefits. The recent surge in large organizations giving up their performance appraisal systems ought to be seen in conjunction with the surge in newer approaches to employee engagement. Real-time solutions can enable both performance appraisal and employee feedback at the same time. As is usual in the HR space, most of the innovation seems to be happening in the US with Indian organizations in particular playing catch-up. HR practices in most old-world Indian industries like manufacturing are stuck in a time warp. The new-age IT industries are better but only in a relative sense. However, the success of organizations like Google and LinkedIn in creating an engaged workforce is prompting our IT doyens to take a relook at their own engagement policies. They are re-examining the entire gamut of operations that deal with how they measure, track and get feedback from their workforce. Be bold! Junk the annual survey. Sure you get some perspective on how your organizations is doing vis-a-vis others in the industry but other than that, the only purpose they serve is as a checkbox in a goal sheet for an HR practitioner! If nothing else, start surveying more regularly, say at a quarterly level. At least you are that much ahead of the game and can identify burning issues sooner. Look to administer real-time pulses to monitor the moods of the your organization. Organizations go to great lengths to track the in and out times of their employees. It is even more important to track how your employees are feeling. Identify metrics that you can track over time. As the old adage goes, what you can’t measure, you can’t manage. The metric could be something as simple as the overall happiness index. Don’t have a digital way to do it? Put colored balls in glass jars if you need to or get your employees to use colored stickers to indicate their moods but get some measure of how your employees feel. Mark interventions your leadership takes on a calendar and track the impact of these interventions using the metrics that you track. Organizations usually take interventions but there is rarely a follow up on whether specific interventions worked or not. Again, just another check box in someone’s goal sheet. Hold your managers accountable for the overall engagement in their teams. Let them know that their performance includes an assessment of how engaged their team members are. If possible, move to a real-time employee-engagement platform. There are startups and small enterprises both in India and abroad that are developing products in this space. Reach out to them and see if you can’t gain a competitive edge by really engaging with your employees the way they want to be engaged. Take every opportunity to solicit feedback from your employees. Really listen to what they are saying. Act on their feedback. The surest way to turn your employees off giving feedback is to ignore their feedback and not act on them. So go ahead, and act on their ideas and suggestions – those that make sense of course. Above all, tell them that you have acted on their suggestions. Let them feel that they have been a part of the overall process. Celebrate your successes together! Do this and I bet you, you will never go back to thinking about year-end surveys again.